Wow. So I remembered this week that I had started a blog a few months ago. Hmm...sort of forgot about it for a couple of months. Well, that's only half true. There were reasons beyond my lack of organization and discipline that kept me from posting for so long. December was super busy (as it is for everyone! ), and I was sick through the entire Christmas break. So I never got around to posting more neat kitchen gadget wish list ideas, as I had planned. Oops. On the bright side, I got a couple of nifty gifts myself. My birthday is three days before Christmas, so between my birthday and Christmas, I got the super duper ultra premium ThermaPen truly instant read thermometer that I wished for (! 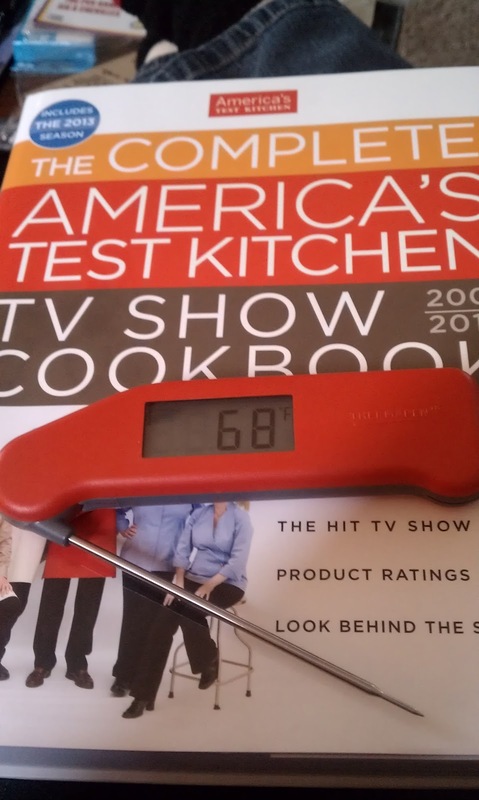 ), an incredibly large and awesome America's Test Kitchen cookbook, and a Wusthof bread knife that I didn't know was vital to my life and ultimate happiness until a few weeks before Christmas when I used a friend's to cut up many loaves of bread into cubes for fondue. I really got spoiled this year. May have something to do with the fact that I turned 40. And I'm okay with that. We got back to working on our mudroom in January, and have actually made some progress, but it's been pretty time-consuming. And finally, our computer is in the chaotic multi-use room that we very descriptively refer to as "the back room." This room was the last of the additions to the original house, and there's not even a real crawl space under it. Just dirt, about a foot under my feet. It also has three exterior walls. This room is cold. Very cold. It's not a pleasant place to spend time. I am convinced that I need a laptop, since I could use it in the warmth of my living room, snuggled in between a couch cushion and a fuzzy blanket. I may have to settle for a space heater for a while, though. This isn't our permanent office, after all. It's a laundry room and pantry. We only put the desk in here as a temporary solution, until the bedroom upstairs gets remodeled, including adding a closet. So temporarily, we are sleeping in the small room that is supposed to be the den. Temporary apparently means five years and counting. Fortunately, the bedroom is getting closer to the top of the list. We only have to finish up the mudroom and complete the long-ignored half-finished front entryway, and we'll start getting the bedroom ready for move in. So hopefully, I'll be typing away here from the real office next December, without having to take breaks to thaw my toes in warm water. Oh! I got another present for my birthday! Well, I don't actually have it yet, but my husband, friends and some extended family members all chipped in to get me a really nice camera! Unfortunately, with the Christmas rush, there weren't any of the ones that our friends recommended, so he just told me about it, and we have to go get one now that the rush is over. I'm pretty sure they're restocked by now. I hear that it will vastly improve the look of the pictures I post here. I may even go back into some of the old posts and replace the most egregious photos. I promise, my guacamole really isn't grey! And Spaghetti Caprese is so much more appetizing than the picture implies. Speaking of Caprese, I didn't realize it until I signed back on here today, but Spaghetti Caprese was the last recipe that I posted....two months ago. I sang the praises of this wonderful combination of fresh tomatoes, basil and mozzarella then. I really do love it. 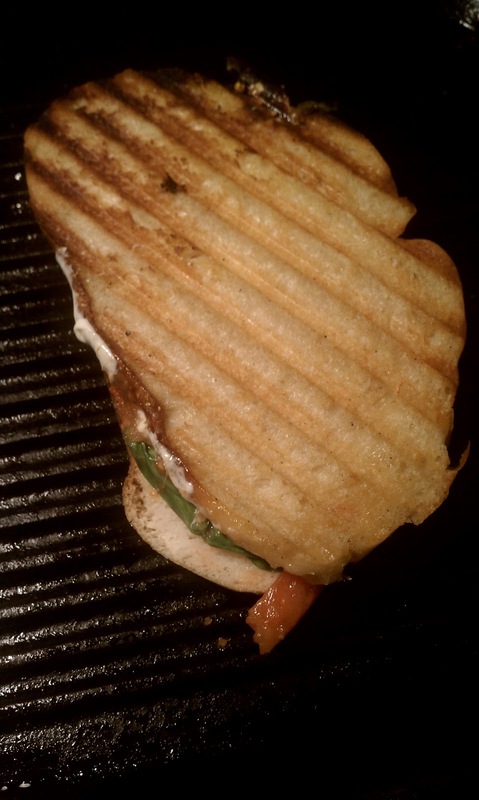 I made these Caprese Panini about a month ago, and wow. Just wow. So very good. 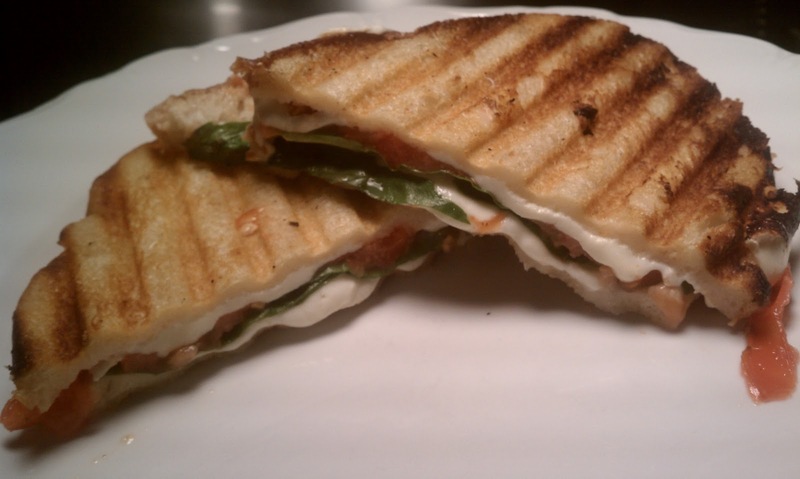 These panini are a fabulous way to experience a bit of summer in the midst of the cold winter that finally showed up here in West Michigan. So the good news is that the prep work is significantly less for this panino than for the spaghetti. The bad news is that you can't just slice everything and throw it on. Let's get started. Get a sheet pan out and place a cooling rack inside of it. Slice tomatoes and lay them out in a single layer on the rack. 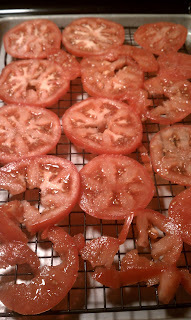 Now sprinkle coarse salt, somewhat liberally, on the tomato slices. Turn them over and repeat the salting. This may seem extraneous, but it's important. Tomatoes are very juicy. And fresh mozzarella contains a lot of moisture. You can't do much about the mozzarella, but if don't salt the tomatoes, then the panini will end up soggy and sloppy. Salt draws the moisture out of foods, so you will find some juices in the pan after a while, and that is moisture that won't end up in your bread. While the salt does its thing to the tomatoes, you can prep the rest of your ingredients. You want to have everything ready, because once you start, it really does go quickly. First, get your pan going. If you have a grill pan, here is the place to use it. Mine is cast iron, and I love it. It wasn't too expensive, either. 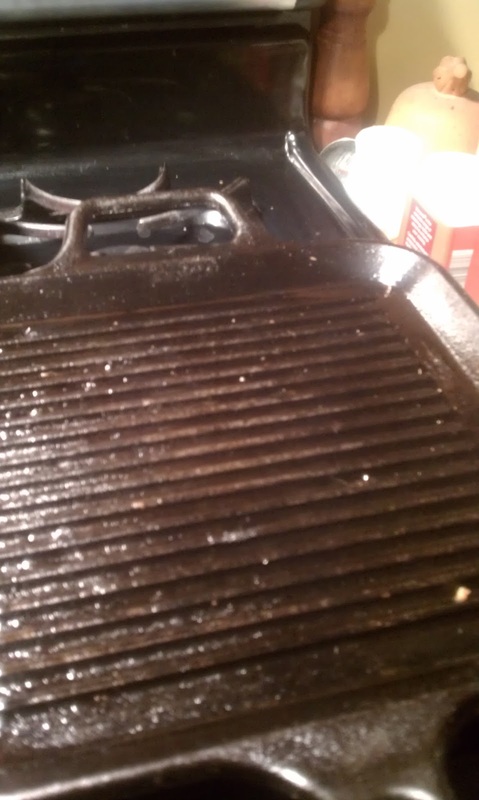 However, if you don't have a grill pan, any heavy skillet will do. You won't have the cool grill marks, but it will still taste good. If you have cast iron, I highly recommend it here. 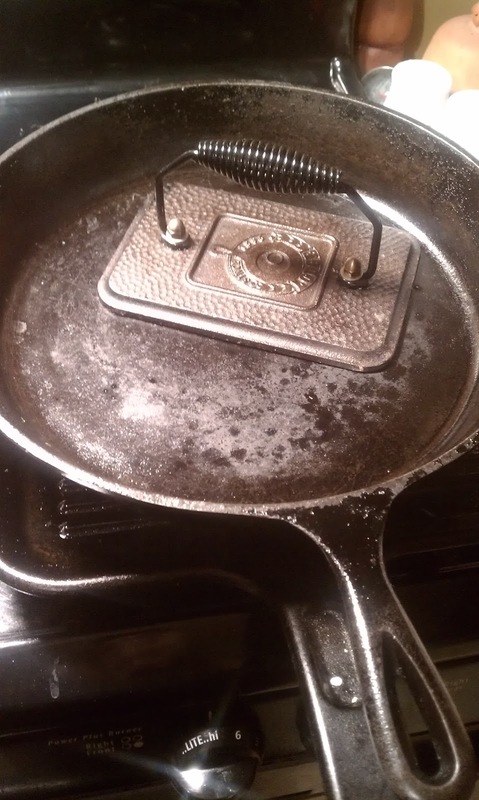 It holds heat very well, and heats evenly. So you won't have one side beautifully golden brown, and the other side pale beige, because the pan wasn't hot enough to cook the second side well. Have I mentioned how much I love cast iron? I do. If only it wasn't so heavy. Although, heaviness has its benefits, which you will see in a minute. 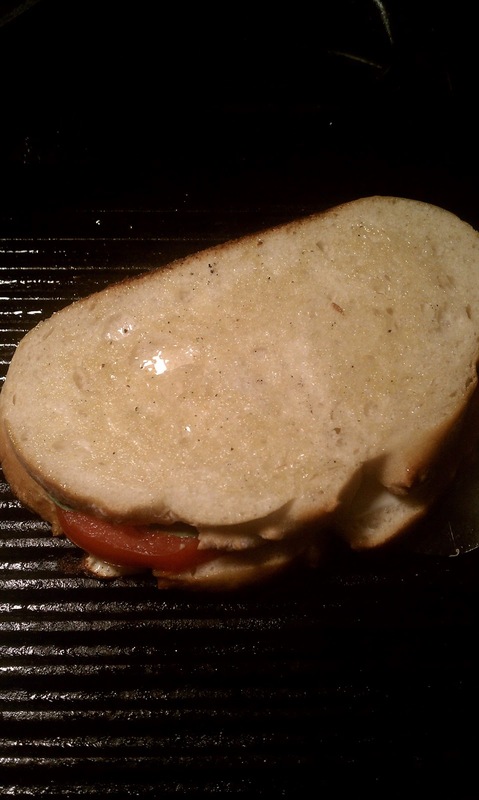 Oh, and of course, if you have one of those electric panini presses or a Foreman grill, you can use it instead. Get it heating up. Now, slice up your bread. Any hearty, sturdy bread will work--I used country Italian bread that I found at Meijer, but sourdough or ciabatta work well, too. 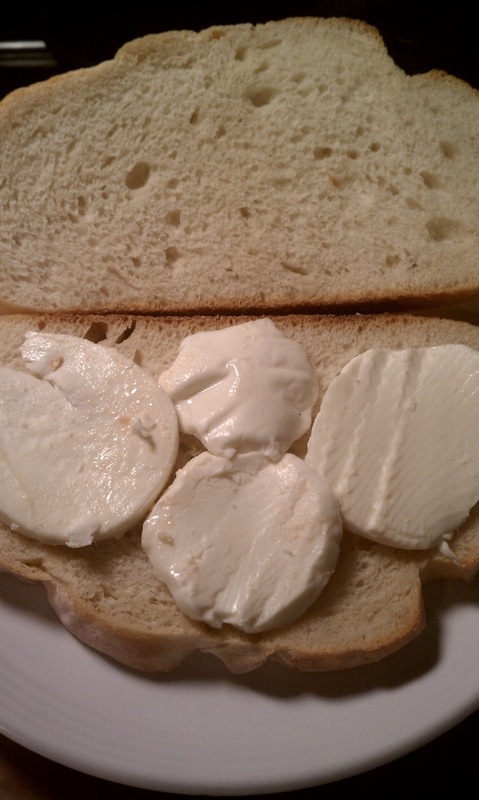 Slice the mozzarella thinly. I buy the big double packages from Sam's Club. It is, by far, the least expensive way to go. It comes pre-sliced, but I actually slice each slice in half, because you want the cheese to be very thin, or else you will have a mess on your hands. You will also need to have lots of fresh basil leaves ready, and a small bowl of olive oil with a pastry brush. I don't know why I can't space the pictures the right way. The options seem to be a bit thin. Anyone? Now build your sandwich. Lay out two slices of bread, and cover it with thin slices of mozzarella. Top those with fresh basil leaves. I like a lot of basil, but you can add as little or as much as you like. Use a paper towel to gently sop any liquid from the surface of the tomato slices, and lay a few slices on top of the basil. Top the tomato slices with some more mozzarella. See? You still get plenty of cheese. You just separate the layers, and then they won't make a mess. 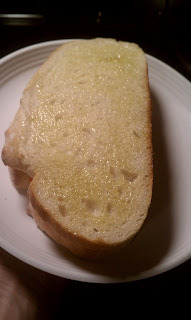 Finally, put the other piece of bread on top, and brush it with olive oil. You want to be generous with the oil. 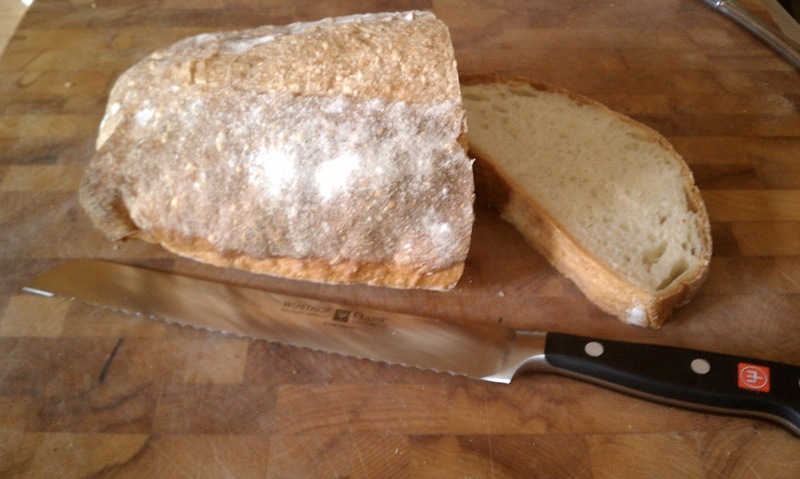 It doesn't have to be thick, but you want to make sure that you cover the bread completely. Unlubricated bread absolutely will stick to a hot pan. And that would be bad. Just to be sure that you don't have any stickage, you might want to brush the surface of the pan with a bit of oil. It will smoke, because you have a screaming hot pan, which is good. Now lay the panini down on the pan, oiled side down, and then brush the dry side with oil. In order to get the sandwich's elements to kind of meld together, rather than slip-sliding around, you need to apply some weight. I have a grill press, but there are two problems with using it here. 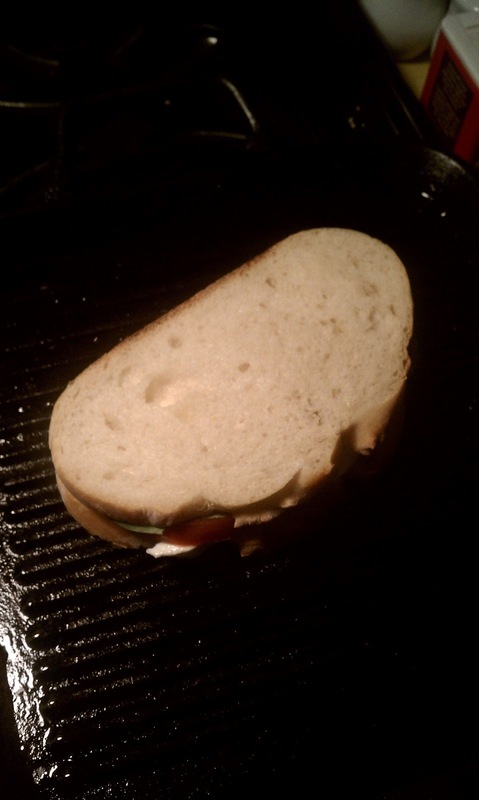 For one thing, it's only large enough for one sandwich, and since I usually grill two sandwiches at one time, that's not helpful. But really, I like more weight to be applied. 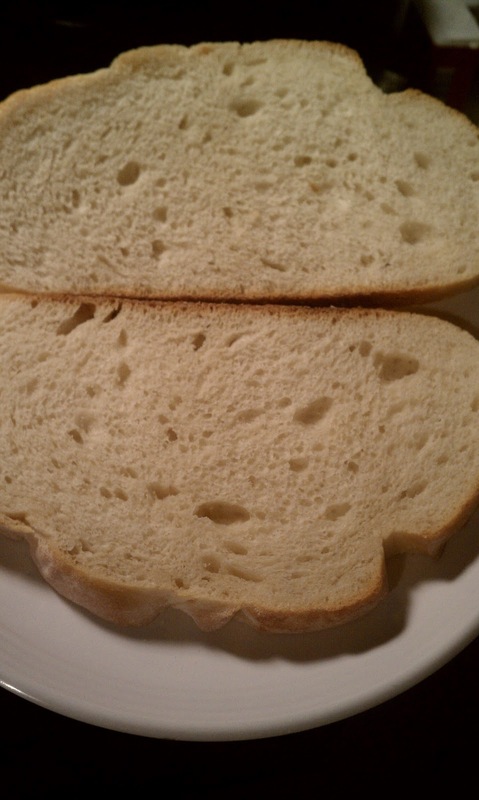 I like the deep indentations that I get in the bread with a lot of weight. They add texture and crunch to the bread. 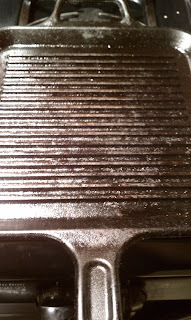 So to solve both problems, I haul out the largest cast iron skillet that I have. It covers both panini, and then I put the grill press on top, just for the extra weight, and to help balance the pan if it's sitting a little wonky. If you don't have a cast iron pan or grill press, just use the heaviest pan you have, and set a few heavy canned goods in it for weight. After a few minutes, the panini are ready to be flipped. 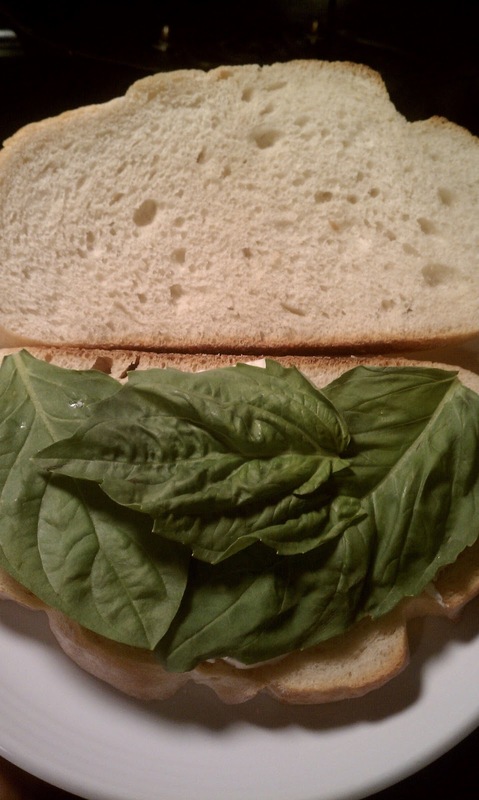 To be honest, I don't remember if this panino was a little too light, or if the lighting just made it look that way. At any rate, it should be deep brown, with a few bits of char. 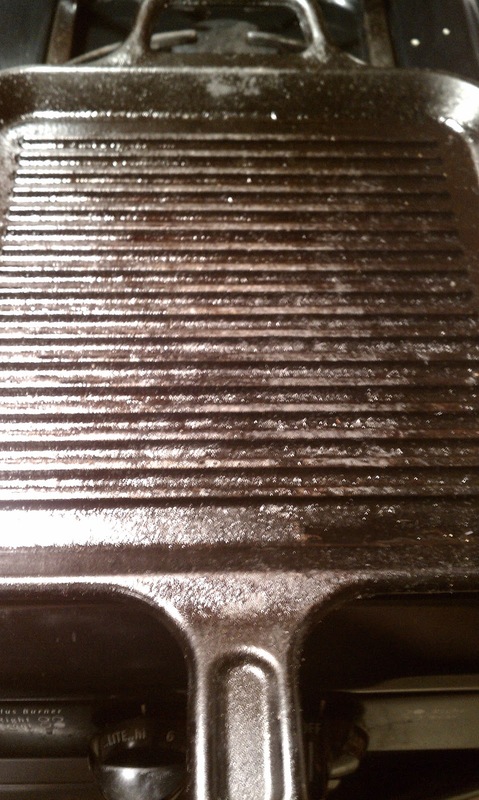 After flipping, replace the weight and grill until the other side is brown and crisp. And there you have it. Make sure that you cut it in half at a deep angle. Because that's how it's supposed to be. And because it looks fancy. 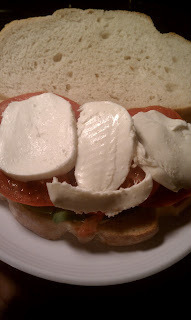 And you get to see the way that the cheese is slowly dripping out of the panino. 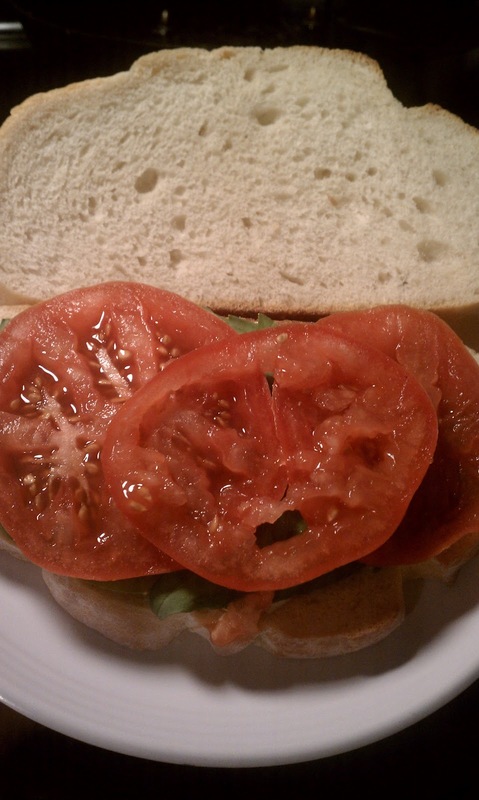 Oh, I am really wishing that I had some tomatoes, basil and mozzarella in the house right now. 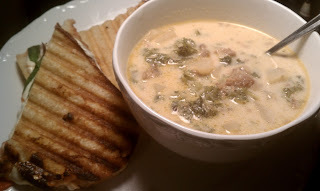 And if you want, you can serve it with soup, like this Tuscan Soup that I created as a knock-off of Olive Garden's Zuppa Toscana, with sausage, potatoes and kale. I have to admit, though....it was a bit much. A lighter soup or salad is enough to make this a great dinner, and the panino is enough to stand alone for a very yummy lunch. Enjoy!